An artist's terrifying conception of what Carmageddon could have looked like, had the prophecy come true. LOS ANGELES, California -- Believers were stunned on Saturday when a prediction by the nationwide fundamentalist radio station Family Radio failed to materialize. 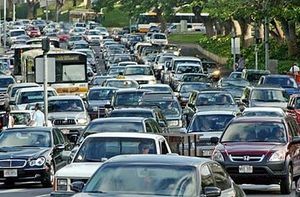 The Christian broadcaster, lead by the elderly and senile Harald Camping, for months foretold the coming of the so-called "Carmageddon" on July 16th, 2011. Camping and his followers believed that those who didn't renounce automobiles, repent, and switch to public transportation, would be engulfed in a gridlock so big that even Jesus himself wouldn't be able to drive through it. The failed prediction hinged on the belief that the planned weekend shutdown of highway 405 in Los Angeles was the key to fulfilling a Biblical prophecy regarding Carmageddon. Rambling essays posted on the internet over the past year described how both the numerical designation of the highway, 405, as well as the planned length of the shutdown, 53 hours, have great Biblical significance. One source explained how "it took the biblical prophet Jebediah 53 hours to slay 405 Philistines, which is an obvious reference to Carmageddon." Many in both the media and the population at large became firm believers of Family Radio's prediction, with some devoting tremendous amounts of time and money to spread their message. Los Angeles mayor Antonio Villaraigosa was especially stunned and embarrassed after having spent the city's entire budget on warning motorist about the hellish traffic jams, and beefing up the police force to deal with expected chaos. "I really don't understand it," the shocked mayor explained at an afternoon press conference, "I thought the Bible guaranteed we would have Carmageddon today!" Local police officials were equally baffled, with the police chief speculating that maybe enough people switched to public transportation and God spared the roads from his divine wrath. Meanwhile, ardent believers still had faith that Carmageddon would occur before the end of the weekend. "We still have over 24 hours left," a bleary-eyed journalist from local TV station KNBC reported live on the air, "I still have faith, and will remain on the scene no matter what." His colleagues from other TV stations went as far as to rent helicopters to fly over Los Angeles in search of potential traffic jams. "We'll scour every block in this city," vowed one chopper pilot, "and by God, we're bound to find a traffic jam somewhere." Despite his prophecy apparently having failed, Family Radio's Harald Camping appeared unphased, stating merely that his "math must have been slightly off," citing potential errors in accounting for leap years, hybrid vehicles, and the Los Angeles smog. He also revealed that his preliminary revised calculations show Carmageddon will actually occur on August 13th of next year, when highway 405 will once again be shut down to finish the roadway construction project.